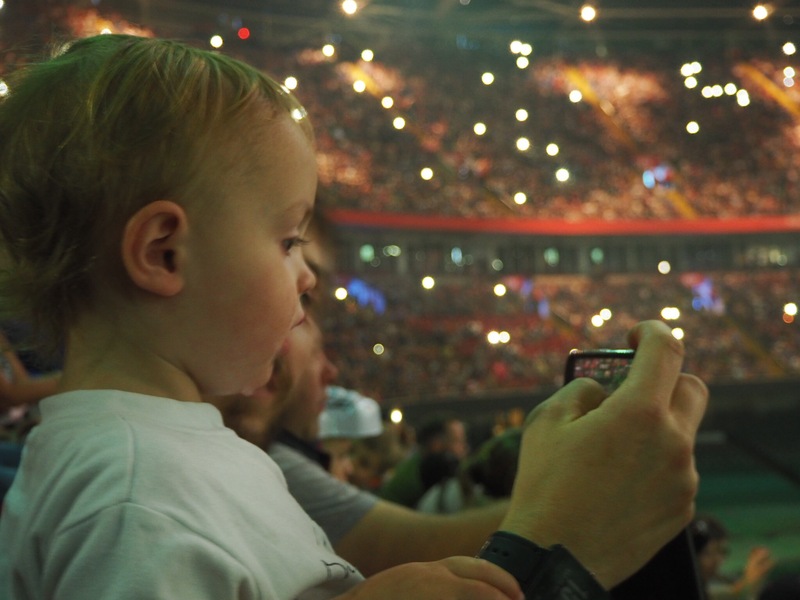 “This is AWESOME!” With his foam finger in the air, blowing his horn and jumping up and down, we had one excited little boy as the Monster Jam trucks revved their engines on Saturday afternoon. 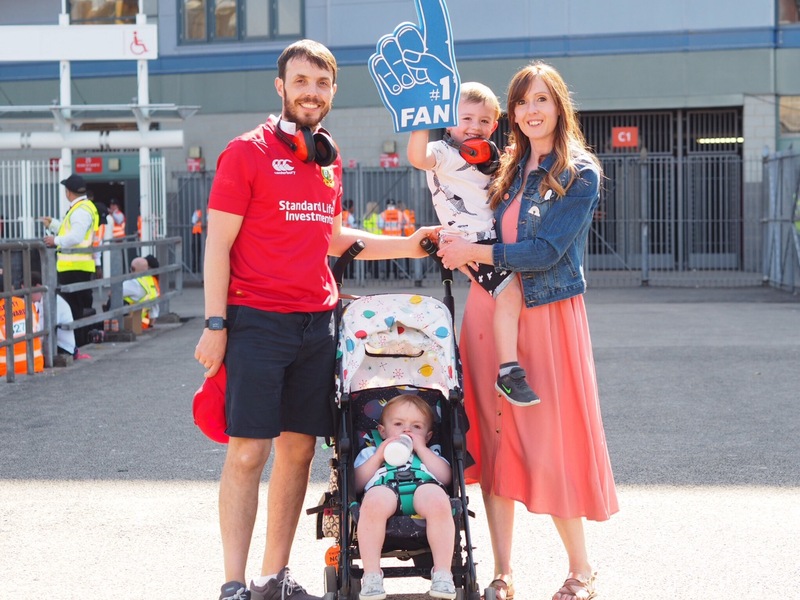 We’d been invited to watch Monster Jam at Cardiff Principality Stadium, and to be completely honest I had no idea what to expect. I definitely didn’t think the city centre would be packed with people waving flags and stalls selling hats, scarves and megaphones, and a general atmosphere of something big going on. And this was hours before the races even began as we headed to the stadium to pick up our tickets. 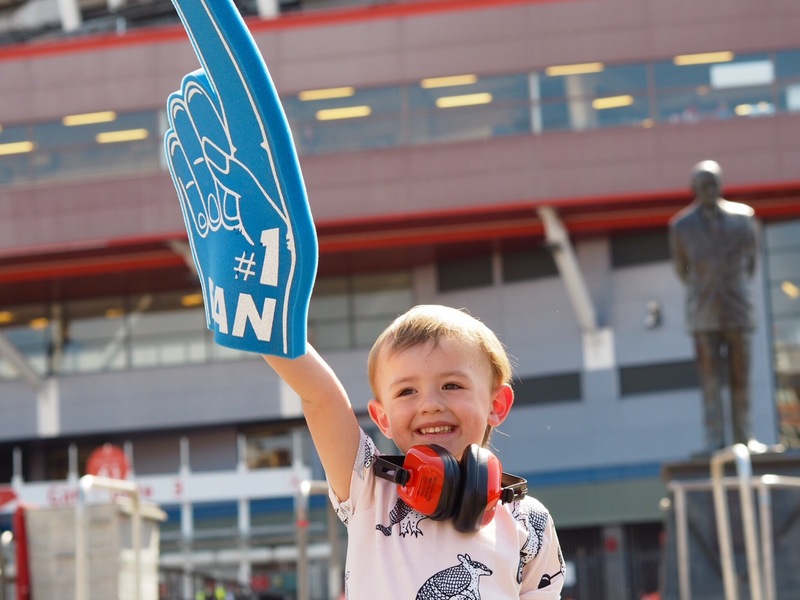 Our eldest son, who’s nearly four, has been asking to go to the Principality for some time, so he was even more excited that he’d get to go inside and see the monster trucks on the same day. 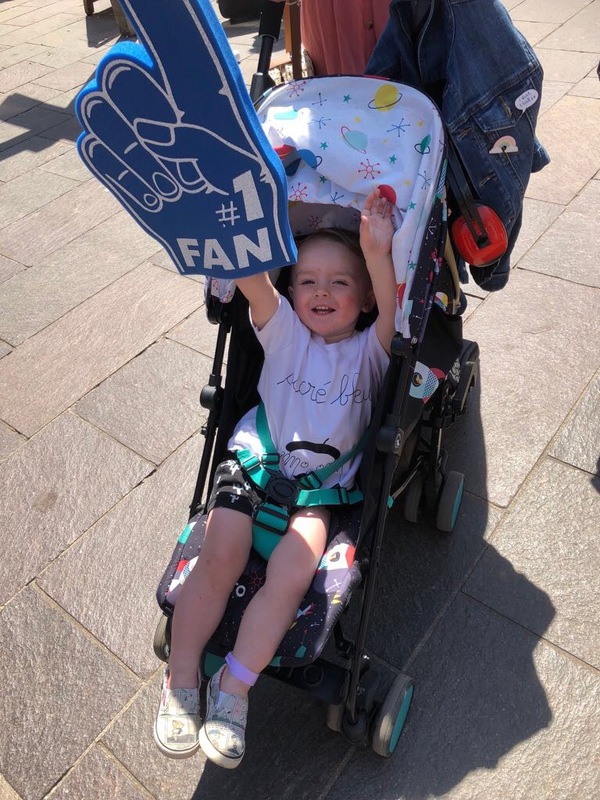 He got so into the spirit of it, and even our youngest had his turn at waving the foam finger as we walked around Cardiff. We made our way inside the stadium just a few minutes before the show started as we know the boys aren’t great at hanging around and we didn’t want them to be bored before anything even got going. There was a very handy family room where we could leave the buggy, so we quirky dropped it off and made our way to our seats – three rows from the front. As we walked down the steps, the stadium was dark, with green lasers flashing over the race track and music playing. It was hard not to get into it. The stadium was packed, the roof was closed, keeping the atmosphere in, and the trucks were lined up ready to go. 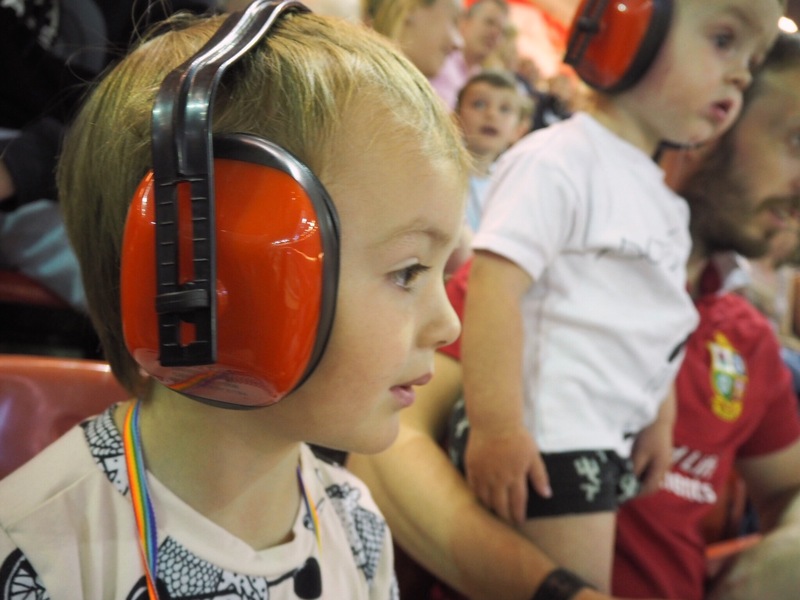 We had just enough time to pop the boys’ ear defenders on and point out a few of the trucks before the show started. The first round was a race, wth two trucks taking on three loops of the track. Our eldest quickly divided the trucks up into “goodies and baddies”, with Scooby-Doo and Monster Mutt Rottweiler on the goodies team, and Grave Digger and Dragon Blast on the baddies team. Zombie was his favourite as he had arms sticking out of the front, which wobbled when he drove around the track. There was a bit of drama early on as Zombie flipped over and landed on its roof. 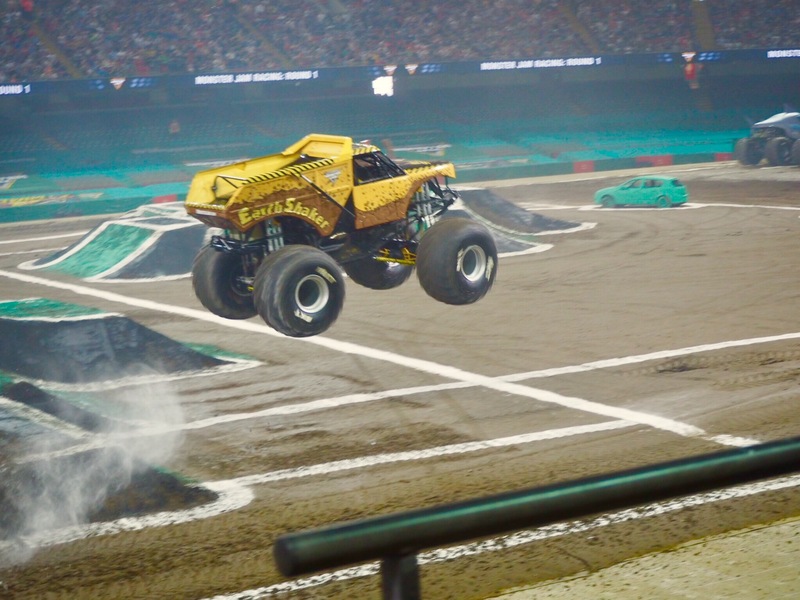 A crane swooped in to turn it back over, and crew ran in to check the driver was ok.
We’d been told by friends who have been to Monster Jam in Cardiff in previous years that it’s very loud, and that ear defenders are recommend, but I had no idea it would be *quite* so loud. 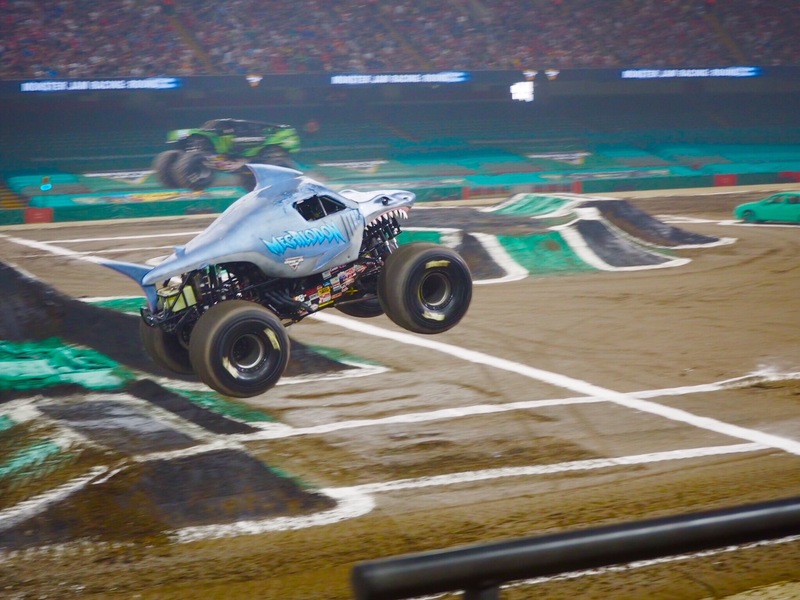 Before the races started, the noise of the engines rumbled through the stadium, but as they revved to go over the first ramp it amplified so much that our two boys jumped out of their skin. Stew was holding onto our youngest so tightly to try and stop him from having a fright, and our eldest insisted I kept hold of his hand for the first few races. It was so loud you could feel it in your stomach! Even though he was getting excited during the races and shouting “cars” down at the track, it was just too loud for our youngest, so Stew took him out after about half an hour. Me and the eldest stayed in, with him clapping and jumping up and down cheering for his favourites. Sadly, I think he found the first round a bit repetitive as there were a fair few rounds of trucks doing laps of the stadiums. We could see the bigger ramps set up in the middle, and he was itching to see the trucks jump over them, but in the end the noise got too much for him too and we ended up leaving. It’s such a shame as all the boys wanted to do this morning was watch Monster Jam on YouTube on my phone, and they’ve been loving it. Watching it back, we saw that following the knock-out competition, which we had seen, there were three other sections of the show, including a freestyle contest where the drivers competed to do the best stunts. There were wheelies, jumps, flips, and bits flying off the cars as they hit the ground. Without the noise, the boys were absolutely loving it! I think maybe they were a bit too young for it – I knew it was a bit risky taking an almost two-year-old – but they’ve both been talking about it since and weren’t at all upset by the noise, they just knew it would be quieter outside and that was that. Actually, from outside you could still hear the engines, and it was obvious why the roof of the stadium was shut! Friends of mine with older children have been raving about the show, and have been more than once so it’s definitely highly recommended. 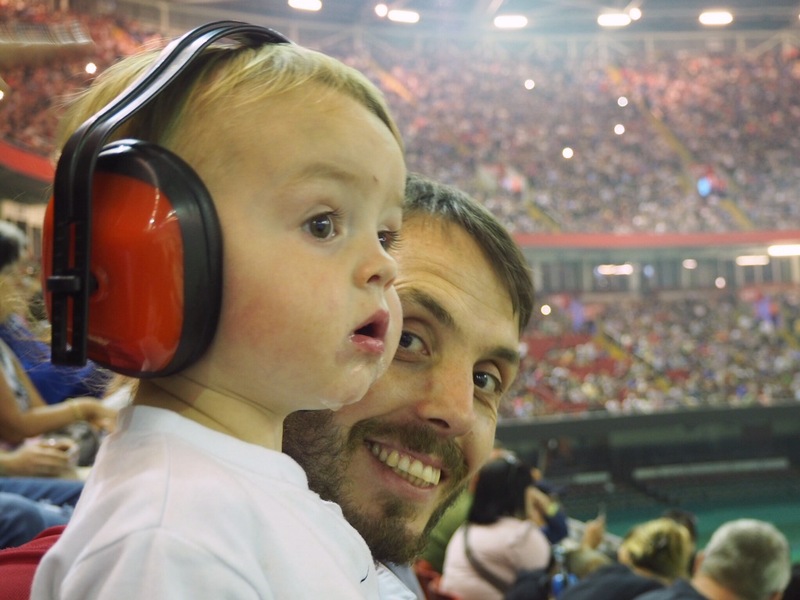 We’ll be back when Monster Jam returns to Cardiff in 2019, with industrial strength ear defenders to get through the whole thing! This was taken after we left … we might not have lasted the show, but we were still smiling!